Chart Trend Analysis for Excel (FindGraph) allows engineers, scientists or graduate students looking to quickly analyze graphed data without having to immerse into complex calculus and statistics books. Chart Trend Analysis for Excel is a comprehensive, feature-rich graphing, digitizing and curve fitting software specially created for these purposes. Take any graph or data from any source (Web or PDF document, for example) add your comments and perform any manipulations, like building approximation lines. Then print your results or export them to Excel or other database. Chart Trend Analysis for Excel comes with a straightforward interface, 200 built-in common graphing functions (like Cardioid, Devil's Curve, or Double Folium), support for Polar, Cartesian, and Parametric equations, various data input/export features and printing options. Built-in Wizard of Digitization will help you to digitize the data. One of the major features that Chart Trend Analysis for Excel provides is an easy way to do curve fitting. The program offers 10 generic fits, including Linear Regression, Logistic Functions, Fourier approximation, Neural Networks plus a library of over 120 industry-specific formulas. Built-in Wizard of Approximation helps applying different curve fits to discover the model that describes data the best. 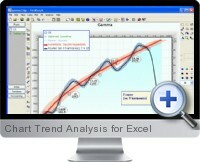 Chart Trend Analysis for Excel also enables users to smooth, subtract, differentiate, integrate, and transform data and curves. Most importantly, Chart Trend Analysis for Excel provides an easy way to copy and paste (embed) graphs to other software applications, like word processors, MS Excel or image editors. Moreover, the program supports OLE automation and can be built-in to other software applications.